The Point 115 Sub has been designed to complement the Point 8 enclosure; its width matching the height of the Point 8 - it can be horizontally mounted under the Point 115 Sub. The Point 115 Sub can also be used as a stand-alone product, paired with your existing system to supplement any missing bottom-end. 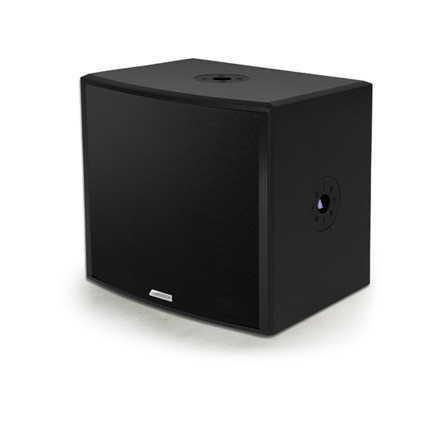 This Active / Passive subwoofer is extremely light weight - 38.5 lbs without crossover, and 43.5 lbs with a crossover. The Point 115 Sub is also available with all SLR ™ rigging systems for the Point Series, thus arraying the enclosure is a breeze in any set-up, in any venue. The Point 115 Sub’s power source is Adamson’s famous 15” ND15-S Driver, which is also used in the Adamson Metrix Line Array Series Sub. This little beast can keep bottom-end up in any small to medium venue with light live material such as Jazz, Instrumental, Ambient, Bluegrass, Folk or Speeches, or as a superior playback system in clubs, restaurants, bars, gyms and public spaces. Combined with the Point 8 enclosure, this systems delivers clarity and warmth to any venue where atmosphere is vital.